IIM Indore celebrated Hindi Fortnight at the Institute from September 1-14, 2017. The two week event aimed on encouraging the IIM Indore community to use Hindi language as much as possible and to feel at ease while using the mother tongue even in official work. The Official Language Committee for this purpose held various competitions during the two weeks which included Antakshari, Extempore and Noting & Drafting. The competitions witnessed huge participation from the students, staff and family members of the staff as well. The fortnight concluded on September 14, 2017—Hindi Diwas. The winners were awarded prizes on this occasion too. 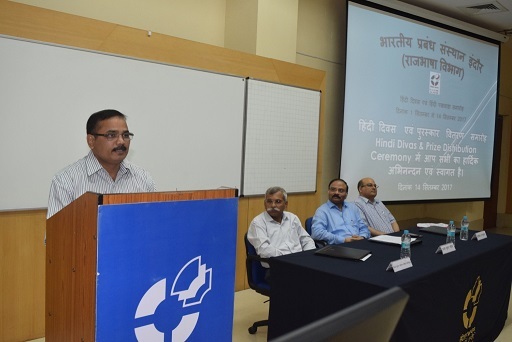 The inauguration of the Hindi Diwas took place in the presence of Shri Ajay Kumar Chauhan, Chief Income Tax Commissioner & Chairman, Official Language Implementation Committee, Indore. Professor Rishikesha T. Krishnan, Director, IIM Indore and Col. Gururaj Gopinath Pamidi (Retd. 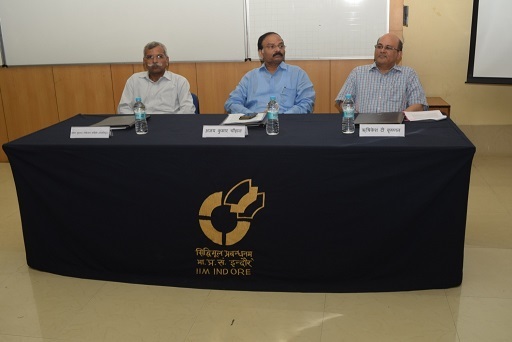 ), CAO, IIM Indore was also present. Mr. S.M. 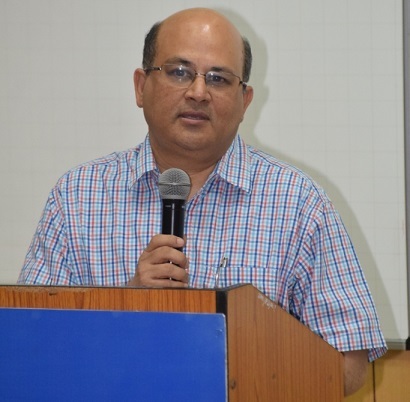 Vaidya, Officer, IIM Indore welcomed the guests. The inaugural started with the melodious Saraswati Vandana performed by Ms. Snehal Moghe and Ms. Vidhita Gholap. This was followed by a singing performance by Mr. Gaurav Trivedi. 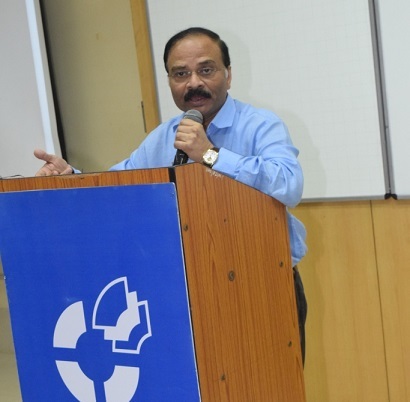 Mr. Jainath Yadav, Hindi Officer of the Institute then delivered the welcome address and introduced the chief guest. Col. Pamidi mentioned that the Institute has been taking various initiatives to smoothen the usage of Hindi among the employees and to lessen the problems faced by the employees in the official languages usage. We strive for excellence and the usage of official language is also one of our aim, he said. 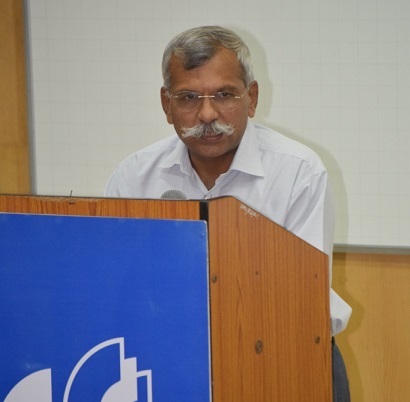 Professor Krishnan said that in the last two years, the Institute has improved in the usage of Hindi as a language. The official communication internally and externally is now totally bilingual. He encouraged the use of simple Hindi so that everyone is able to understand and feels at ease while using the language. Shri Chauhan in his address appreciated the efforts put in by the Official Language Committee at the Institute and noted that the competitions organized help the students, staff and the entire community to enhance their skills in Hindi. He also mentioned that Hindi is a language which can motivate a person to pour out his or her feelings in an apt manner. 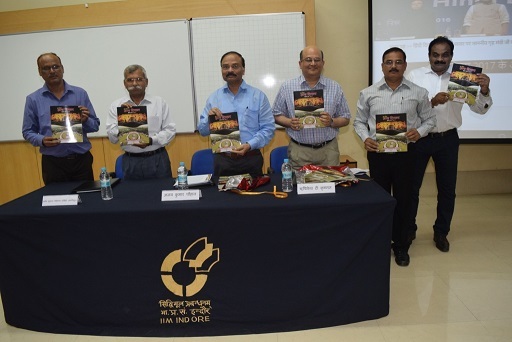 The event also witnessed the releasing of the Hindi Magazine of IIM Indore—Gyaan Shikhar (Second Edition). The Institute has also been celebrating the birth centenary of Pandit Deendayal Upadhayay. Following the celebrations, the Institute had organized an essay writing competition in the last month. The winners of the essay writing competition also received the prizes during Hindi Diwas celebrations. Mr. Rajesh Shrivastava of Hindi Department gave the vote of thanks.